Can Vietnam take a lead in ending bull and buffalo fighting? Vietnam’s media is openly debating banning a buffalo fighting festival after a human death at this year’s qualifying rounds. While ending buffalo or bull fighting has been a vast international campaign for decades, usually centring on Europe and South America, it is possible Vietnam will be next to set a positive example for the rest of the world. 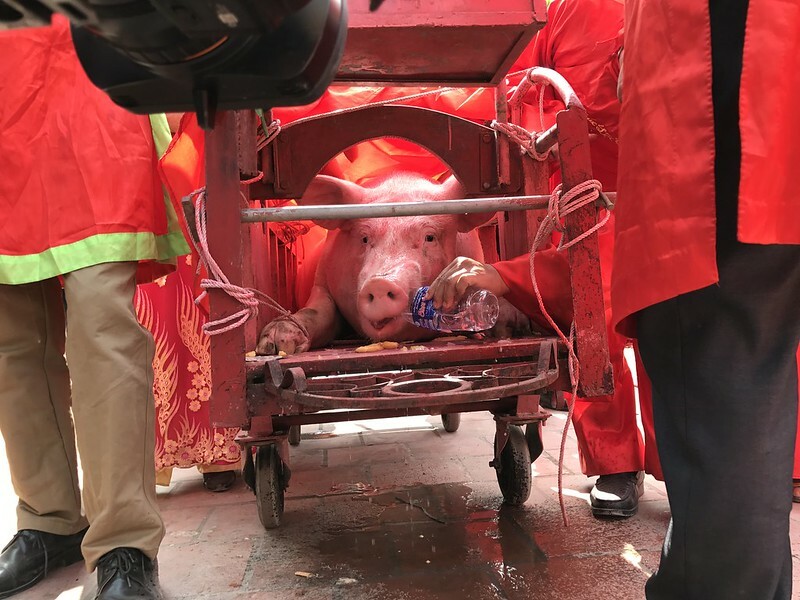 Ever since Animals Asia’s campaign to end the Nem Thuong Pig Chopping Festival in 2014, “barbaric festivals” have been a huge debate in Vietnamese society. The public outcry prompted the Ministry of Culture, Sport and Tourism to order all “out-dated” and “uncivilised” festivals to end, with seven events – including buffalo stabbing and fighting festivals – already having been stopped forever. The banned festivals have sent a clear message that the country is open to positive change for animals. Now, the spotlight is on the Do Son Buffalo Fighting Festival after a buffalo killed its owner in the ring on 1 July. As a result of the killing, the nation’s culture ministry has acted quickly, instructing the provincial cultural department in charge of the festival to review security and safety at the event. The event has been cancelled while the review is underway and there is a chance the ministry will scrap the buffalo fighting festival entirely. The tournament proper is due to take place on September 28 in the northern port city of Hai Phong. Since the death at the qualifying event on Saturday 1 July, every major news outlet in the country has covered the story and a national debate has erupted discussing whether the traditional event should remain a part of the modern Vietnam. “As an agricultural country, a large proportion of Vietnamese traditions and festival revolve around livestock. But in the last decade the country has developed at an astonishing rate and where there used to be rice paddies, now there are high-rise office buildings and apartments. “Traditions such as buffalo or cockfighting used to go unchallenged, but that has all changed. In 2014 the country first questioned the Nem Thuong event. Now the country is debating what kind of nation it wants to become – what examples does it want to set for its children. And increasingly, that has meant re-evaluating old behaviours, with some being abandoned." Vietnam’s debate over the Do Son Buffalo Fighting Festival mirrors similar debates in other parts of the world like Spain, France, Portugal, Mexico, Colombia, Venezuela, Peru, and Ecuador where bull fighting continues. “It’s wonderful to see this debate taking place in Vietnam – and especially that it no longer needs to be prompted by animal welfare organisations like Animals Asia. The national media is now well aware that this is an issue people are hugely interested in and want to see discussed. “Like so much animal cruelty the buffalo fights are rooted in Vietnam’s agricultural past, but they no longer represent the modern Vietnam which is now a forward-looking country. “Vietnam has already shown itself keen to stop animal cruelty spectacles with the Ministry of Culture making strong comments against such events, but it is to be expected that some conservatives will need to be convinced and won over.